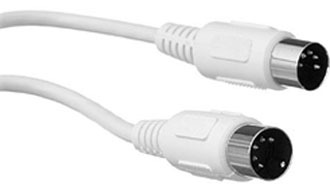 MIDI cables link your MIDI Controller or device to your MIDI Interface via a 5 pin connector type. Unlike the XLR connector type, you'll notice that both ends of the these cables are male. These cables are a one way digital data street. In other words, you will need 2 of these per MIDI controller you want to hook up. One to transmit and one to receive the digital data between the MIDI controller and the MIDI interface. Use them to connect your drum machine, electronic drum kit, synthesizer or other keyboard controller to your system. It's also possible to daisy chain multiple MIDI devices to each other via the "MIDI Thru" port. Since the data is digital, you don't have to worry about signal loss unless the lines start to get extremely long (~50 ft or more). As usual, unless you enjoy untangling cord-knots I would recommend keeping the length as short as possible. These are often available in electronic stores that don't necessarily specialize in music gear (such as Radio Shack, Fry's, or Best Buy). Finally, you can get female-to-female adapters that allow you to combine 2 cables into 1 longer one. This is a nice alternative to buying long cables since you can adjust them as your needs change. This is a great place to save some moolah without compromising the quality of your sound. Pick some up and bring the joys of MIDI into your studio life. If you stumbled onto this page without really knowing the full benefits of MIDI then check out our discussion here for more info. Most newer MIDI devices simply use USB interfaces (which is pretty convenient). But you can get good deals on older gear that uses the good old fashioned MIDI format - so the MIDI cable can still have a valuable spot in your studio. This is always something I recommend to new users. Before you open up the wallet on a newer unit take an older model for a spin and make sure this is something you want to spend your hard-earned cash on!